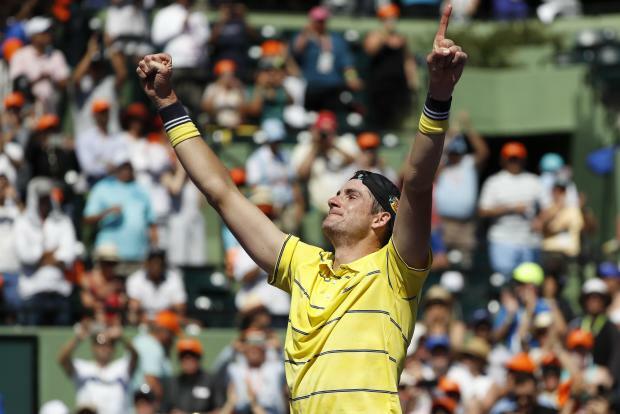 John Isner found new energy and outlasted Germany's Alexander Zverev 6-7(4) 6-4 6-4 at the Miami Open on Sunday for the biggest title of his career. The 32-year-old American was tiring noticeably in the second set but won the ninth game to go up 5-4. The moment inspired Isner, who changed to a yellow shirt and won that set and the next for his first victory over Zverev. "I couldn't have scripted this," said the 14th seed in a courtside interview after winning every service game. The win will enable Isner to become the highest ranked American at number nine when the new world rankings are released on Monday. The match, which lasted two hours and 30 minutes, was the last for the Miami Open at Crandon Park. After 32 years it will move to a new facility next year. It also capped a successful weekend for American tennis with U.S. Open champion Sloane Stephens claiming the women's title on Saturday.